Accusonus has debuted Voice Leveler, a new plugin that treats gain inconsistencies are common in both audio and video recordings. Accusonus said such inconsistent levels often happen as a result of intentional or unintentional speaker movement, non-ideal microphone positioning or heavy audio and video editing. The leveler uses a single-knob plugin to save from hours of manual gain adjustments. 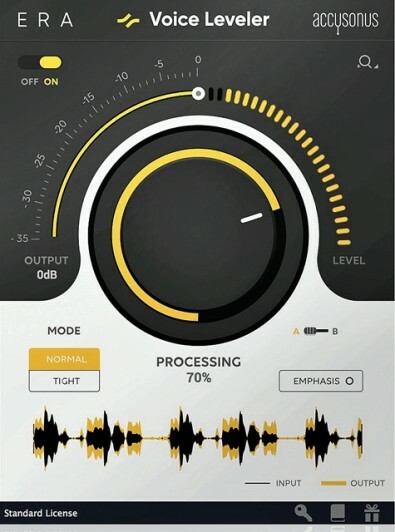 The Voice Leveler joins Accusonus’s Era range of one-knob plugins. It automatically detects level differences in vocal and other voice recordings and enables the user to correct them in real-time, saving time that would otherwise have been spent making manual gain adjustments. As well as enabling you to level out vocals just by turning a knob, the plugin also includes a Tight mode that offers a more focused sound that makes vocals stand out from the music. Emphasis mode, meanwhile, detects problems in tonal balance and applies subtle processing to correct them. The Era Voice Leveler is available now as part of Accusonus’s Era Bundle Standard and Era Bundle Pro. These are currently available for the introductory prices of $119 and $349 respectively, and run on PC and Mac in VST/AU/AAX formats. Demos are available, too.